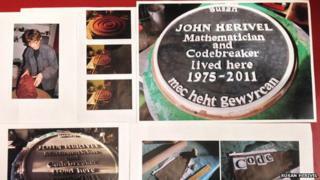 A World War Two Bletchley Park codebreaker has been honoured with an unofficial commemorative plaque. John Herivel's system of breaking the Enigma ciphers became known as the Herivel Tip or Herivelismus. His daughter Susan, an Oxford potter, has made and installed the plaque at the Lonsdale Road house where he lived. She said she did not want to wait for an official blue plaque, which can only be applied for once a person has been dead for at least 20 years. The Oxfordshire Blue Plaque Scheme considers exceptions in "rare cases", for example after the centenary of the person's birth. However, mathematician Herivel was born in 1918 and died in 2011. Ms Herivel now lives at the house where the plaque was unveiled. It was home to her father for 40 years. "I want this and the garden to remain untouched if the house is sold and may take out a covenant to keep things as they are," she said. Herivel was part of the team that broke the Enigma code, an action which has been credited with shortening the war by two years. In recent years, official blue plaques have been unveiled in Oxfordshire for Bee Gees singer Robin Gibb and composer Gerald Hugh Tyrwhitt-Wilson.